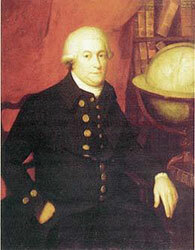 English Captain George Vancouver, tasked with mapping the Pacific Northwest coast, sailed by the mouth of the soon-to-be-christened Columbia River on April 27, 1792. Though he knew there was a river emptying into the ocean at the spot, he decided against an attempt to cross the bar, and continued north up the coastline. A few days later Captain Vancouver’s ship, the Discovery, encountered the Columbia Rediviva, captained by American Robert Gray, sailing south. Gray asked Vancouver about the river’s mouth at latitude 46° 10′, which he had passed himself on his voyage north. Vancouver declared it too small to worry about. But Gray wasn’t so sure of Vancouver’s analysis, and on May 11, 1792 he sailed up the river’s mouth, the first Euro-American to do so. He named the river after his ship.